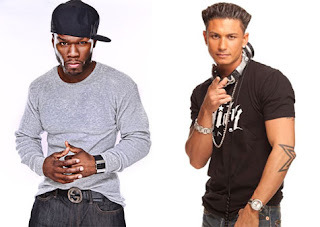 The Spotlight by Brittany Shawnté: Pauly D Scores G-Unit Deal! Jersey Shore's Pauly D has confirmed that he is signing on to 50 Cent's G-Unit in an exclusive interview with XXL. His pending three-album deal with the label will supposedly include the release of Pauly D-branded headphone sets. The deal should be finalized very soon. "I would say the end of the year,” Pauly said in the interview.. In addition to this deal, Pauly also has an upcoming spinoff show of his own that will premiere on MTV soon, which will showcase his DJ career! GO PAULY! I always root for him. He's my favorite male cast member from Jersey Shore...always so relaxed and chill. And he's cute too haha! And speaking of the shore, IT'S JERZDAY! I think I'm going to do my recaps of the show ALL SEASON LONG! This is a first! Hey, they're in Italy, why not?